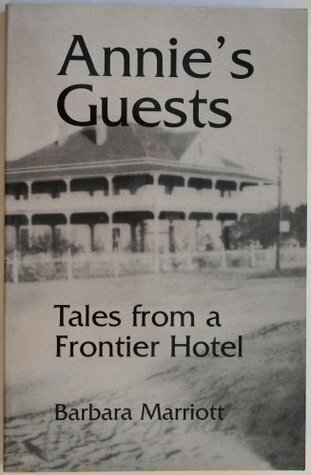 While at the Triangle L ranch in Oracle, I picked up Annie’s Guests: Tales From a Frontier Hotel by Barbara Marriott. I love local history — this emerged out of an oral history project of the Oracle Historical Society. People of color have been erased almost entirely from many histories of the west, so it was brilliant to find them here front and centre in the history of the Mountain View Hotel. First a couple views of the hotel itself as it once was. Mountain View Hotel launched in a blaze on 19 Feb 1895, with champagne, music and dancing until morning. The Neals built, owned and ran it from 1895 until 1950s, although it experienced its heydey in the 1920s. For the first time I can almost imagine a kind of golden age in this building owned and run by a couple who were each of mixed African American, Cherokee and European heritage, a place that attracted visitors from around the world and became the social centre for the entire area. The building of it took over six months, and used over one thousand adobe bricks all made on site. They had it stuccoed and painted red, with white lines drawn on to make it look like brick. It’s high ceilings were covered with panels of pressed metal. Wood lined its interior. The luxurious first floor rooms each contained individual fireplaces trimmed in black and gold. The second floor rooms had individual freestanding wood stoves. The Mountain View once consisted of two building connected by a walkway to form an L. The main house with its bedrooms and terraces, where visitors coming for their health and hope for healing of TB often slept in the summer, is now First Baptist Church. I’ll end this post with the picture of the present, it makes me a little sad. The second building contained the kitchen, dining room, and ballroom Additional shacks and bunk buildings for staff, corrals and stables surrounded them, all torn down in the 1960s. Annie loved events — they held picnics, cardgames, dances, shooting competitions. They built a nine-hole golf course – the grass was lubricating oil mixed with sand. They built a croquet court and outdoor dance pavilion. Small wonder it became the social centre for Oracle, Mammoth, Florence, Tucson. From 1895 to 1920, they hosted visitors from 45 states and 12 foreign countries including Russia, China and Australia. My favourite, though, was Lautaro Roca from Camp Number 2, or “Camp of the Horribles” in Tumacacori (22). I never had heard that, though I’ve the Mission at Tumacacori has given me the terrifying creeps since I was a toddler. By late 1920s, Biltmore and others began a building spree of luxury resorts and hotels in Tucson & Phoenix, which put an end to many of the glory days of the Mountain View. But I wish I had been able to stay there, even afterwards. So to turn to the main characters — Marriott’s book looks at six different people who lived or stayed there, it was a nice way to organise the book. William Curly Neal (1849-1936) arrived in Tucson in 1878. He was working as the driver of an Army Supply Wagon – to avoid Indians he had come by back trails, stopping at Camp Oracle. After leaving the army a year later, he would decide that Oracle would be a good place to build. Born 25 March, 1849 in Tahlequah, Oklahoma, Curly was part of the Cherokee Nation. His father was of African descent, and his mother Cherokee and a survivor of the Trail of Tears. Mother and son left Oklahoma after the murder of his father. They moved in with two aunts, but when his mother died he ran away from home at the terrifying age of seven. At nineteen he met Buffalo Bill Cody (before he was Buffalo Bill and just William Cody, aged only 22). Neal was shining shoes at the railroad station where he had long worked and survived with odd jobs — the brakemen called him Curly for his long black curling hair (his Indian name was Sitting Bear). He left with Cody as an aide, became a fellow scout and friend. They surveyed land, killed buffalo for train barons, scouted in Indian wars, and Buffalo Bill would often show off the scar along Curly’s head from a near deadly bullet. The West has such a tangled history of race, exploitation and conquest. 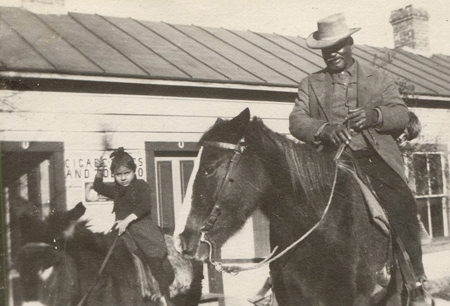 In Tucson Curly took a job as a cook at the Maison d’Arcy restaurant, joining a tight-knit community of African Americans in Tucson (Marriott notes there were only about 150 in whole of Arizona territory). He started his own business digging cellars. 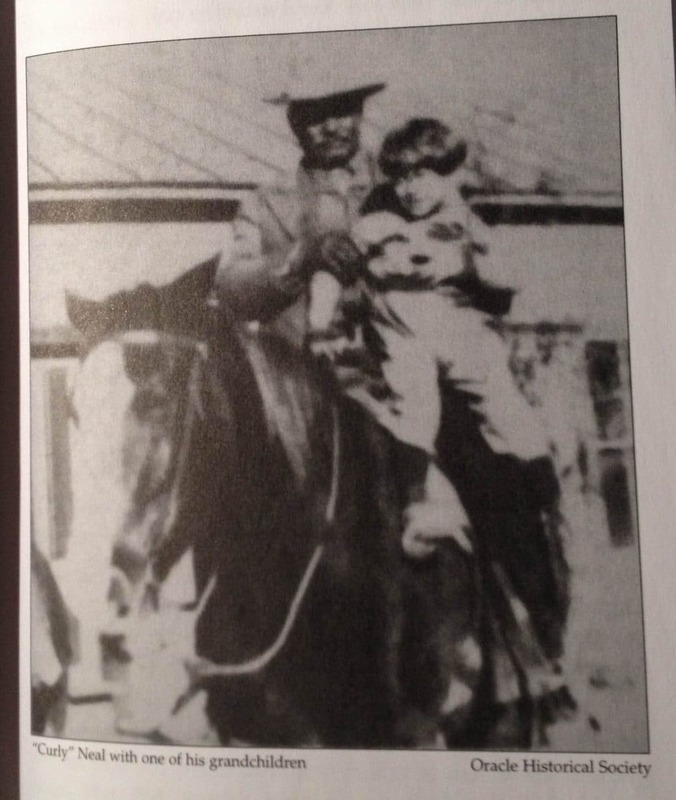 He opened Coral Stables/ Opera House Library Stable on Pennington which became his central business, earning him enough money to make loans to other members of the black community. He started running a stage line from Tucson north up to Shultz, Oracle, Mammoth and the surrounding mines, then won a mail contract for Tucson-Oracle-American Flag Mine (there is nothing there now where once sat an great tent city), this expanded to Manleyville, Southern Belle mine and Mammoth as miners and their families settled the area. Curly also contracted with the mining companies to move ore and water and wood for mines. His most dangerous business hauling bullion from Mammoth to Tucson. His wife, Annie, often rode shotgun. While in Tucson he had become friends with Hannah and Wiley Box. Hannah’s father a German, and mother Cherokee, like Curly’s mother a survivor of the Trail of Tears. Wiley’s father a white English physician, and his mother from New Orleans of African descent. Their daughter Annie was born on the Cherokee reservation on 8th January, 1870. Hannah was only 16. Wiley was mostly a gambler and prospector. 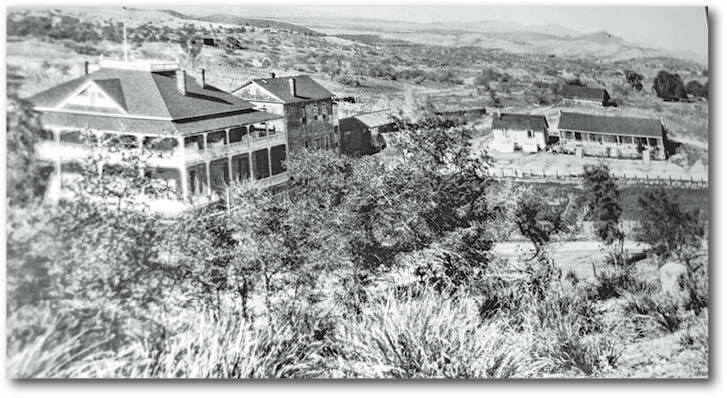 In Tucson Hannah ran a boarding house where Curly stayed, before marrying her daughter Annie. Annie’s sister Josie remembered he always smoked the best cigars, carried a silver flask, and always had a bag of candy for her. When they married in 1892, Annie was 22, and he 43. Despite the difference in their ages he was already her third husband. Annie Magdalen Neal (1870-1950) was pretty damn amazing. She had been educated at St Joseph’s Academy until she fell ill at the age of 14 — she remained a devout Catholic. She played the piano and composed her own tunes, two of which were published (though now lost, which I find so tragic). The Oklahoma March had been inspired by their family’s journey to Tucson when Annie was only 9. They moved like so many others for health reasons, after her father came down with yellow fever. She remembered thirst the most, and then the cold — they couldn’t light fires for fear of (other) Indians. When they arrived in 1879, the total number of African Americans in the county was only 57. She first married James Lewis. A soldier, she went with him to where he was stationed in Yuma. She was there when her parents were put in jail, accused of stealing $1000 from a man named John Bryson. Later they were charged with attempting to poison Bryson on the testimony of another man who claimed they had hired him before he fled to Mexico. Both were found not guilty. Curiously while in jail, Wiley wrote letters to Lewis, not his daughter. After gaining their freedom the couple went to Mexico themselves, returned with daughter Josephine. In the meantime Annie had left James and married William Easton in 1887. Curly had also married before, to Jesus Leon in 1881. The match between himself and Annie was pushed by her mother, who promised them gifts of land in Oracle. Thus they bought land in Oracle, and Hannah deeded her daughter a number of acres. Annie, like Hannah, acted as a midwife, and had authorization from Catholic church to baptise babies. Curly built hotel as a business venture, but also to help Annie emerge from the deep depression she suffered after the death of her mother in 1894. It succeeded. 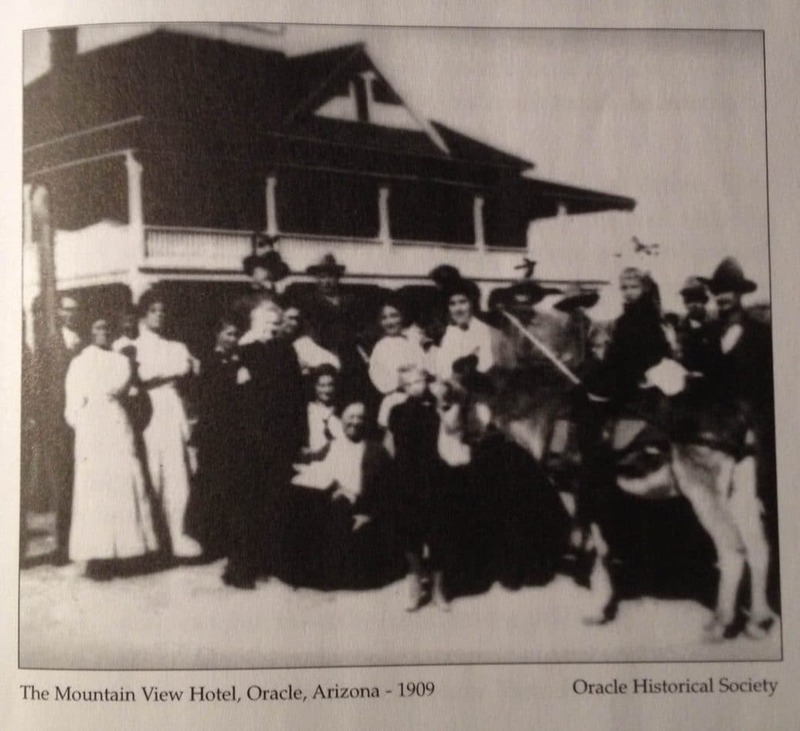 Before Oracle’s first church was built, Annie arranged from priest to come once a month, and they held services in the hotel’s recreation room. They had also adopted her sister Josephine, who was only 6 yrs old at Hannah’s death. Wiley lived until 1913. At his death he had been staying at an old-club in Tucson, on Court st between Pennington & Myers that catered to black men (I wonder what is there now…). A side note — he had been drinking for days, apparently, and in a stupor when his friends wrapped his legs in burlap, added kerosene and set them on fire as a joke. I assume they were only slightly less drunk than he was, only taking him to hospital when it became clear they wouldn’t heal on their own. Wiley died of the burns. On his death certificate Annie stated he was white – there is, of course, no way now to know why. One possible reason was to ensure he could be buried in the cemetery without problems — cemeteries in the area were often segregated. Annie saw her father off in style though, with a procession of 5 automobiles. Marriott notes an increase in racism — and while I am doubtful there ever was a time in Tucson where racism was not a problem, it is a good reminder of how things actually got worse after the turn of the century. Jim Crow only really arose during that period, though Marriott casts all the blame on the increasing numbers of wealthy East Coast families in the area who after the 20s stopped including the Neals in their social visits and functions, who opposed Curly’s attempt to legally homestead the area their cattle had long been grazing, and who would destroy his business through a suit claiming he was collecting too much local wood. She used to have shooting contests with Buffalo Bill and his men when they stayed at the hotel. There is nothing I do not love about her. I confess I find that entire passage astonishing. Written on land so recently belonging to the Apaches and taken by deadly force. The idea of importing Indians (not Apaches I would guess) for entertainment, and painting Mexicans (ignoring their own mestizo heritage) is mindboggling. The costumes are as well. I wonder what Annie and Curly thought of it. I wonder how this connects to minstrel shows, I wonder how people explained this kind of appropriation of the cultures of those they believed inferior, and how these events contributed to such dynamics. Honestly though, I cannot fathom it. A few more tidbits from the chapter — the entry about hearing that Arizona had been admitted into the union, and wondering if anything would change. It seemed that nothing really changed, at least not for some time. her own story is fairly tragic, her husband died fairly young, her first son was killed in action in WWI. Her daughter had severe post-partum depression after the birth of her first child, and drowned herself on the return journey from Europe (her husband had tried to cheer her up). Elizabeth Wood thus raised her grandson, only for him to be killed in action in WWII. She gave a great deal to the town, sharing her wealth as it were. 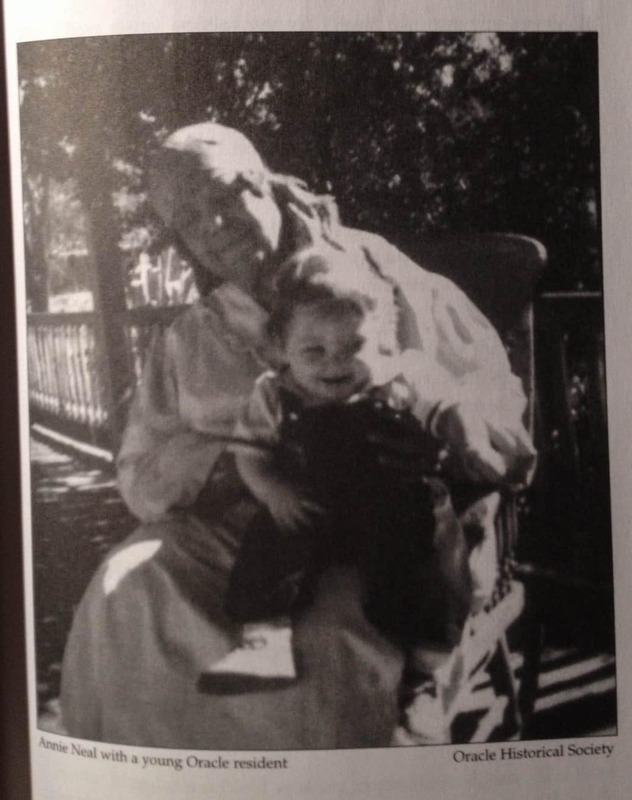 She had a public well dug, paid for the building of a community playground, donated stained glass to the united church, and before her death donated her Southern Belle ranch to the Salvation Army as a youth camp. She also writes about Jane Russell visiting the Linda Vista Ranch, having publicity shots taken at the Cañada del Oro. The ranch was owned by Goerge Stone Wilson, and Harold Bell Wright had stayed there to write, and then film, The Mine with the Iron Door. That would eventually be partly what brought Buffalo Bill to file mining claims there, and Wood knew his wife, but that is all for another blog. Some final views of the Mountain View and all the people who lived and worked there. I love this photo, and only wish it were a bit clearer. A final view of the hotel as it looks today, its outbuildings torn down, stripped of its balconies, and incorporated into a Baptist Church — makes me a bit sad to be honest.